Software license administration is complex. If not their wouldn’t be compliance disputes and organizations would not overspend hundreds of thousand Euro’s on software that they do not need. In an imperfect world, License Manager Data Center Edition is as close as you can get to perfection. License Manager Data Center Edition embeds the highest level of license process automation.It takes you – the services provider – less time to optimize the license position of your customers. 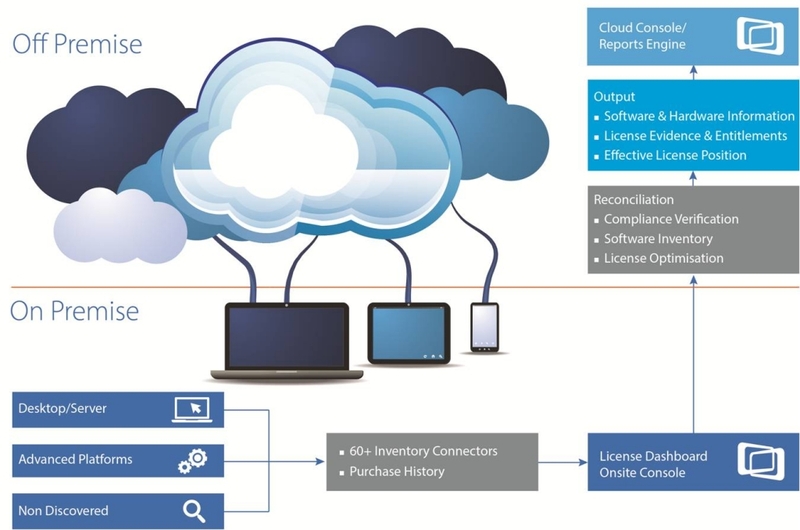 Simplify license administration by automated import and validation of license evidence from all major software suppliers (Microsoft License Statement, Vendor and Reseller sales records, single license documents). It saves time and improves the data input accuracy. Use software discovery data and software inventory data from solutions that are already deployed in your customer’s organization! Connect with over 40 industry recognized solutions (f.e. SCCM, MAP Toolkit, Altiris, Frontrange, SNOW, etc.) that produce inventory data that can be cleansed and normalized in License Manager ( also called ‘software recognition’). License Manager then calculates the most effective deployment for the software licenses. Reduce complexity and save time by simultaneous optimization of licenses over all domains. Un-paralleled automated processes deliver an accurate ELP (Effective License Position) in record time including intelligent license reconciliation, with minimum administrative overhead. In situations where your customer already has one or more software inventory solutions deployed, the inventory data from these solutions will be processed in License Manager. In case no discovery/inventory solution is deployed we can meet this requirement by delivering the Dashboard Discovery solution. Onsite Console: The Onsite Console utility is installed and configured at your customer’s site for the scheduled data collection of inventory data from one or multiple inventory solutions. Data is then transferred to the License Manager platform for analysis by your license consultants. 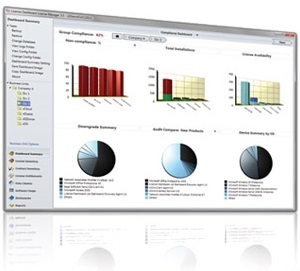 Cloud Console Web Interface: offers your customers role-based access to all relevant dashboards and reports f.e. compliance, software usage, license surpluses, / shortages, contract values, software metering, etc.). Automated import of the Microsoft Licensing Statement (MLS) import – a solution that verifies the MLS data and logic and then imports the Microsoft entitlement data in the License Manager solution for processing. Bulk upload – takes multiple product license documents from multiple software suppliers or resellers for automated import in License Manager. Single-license entry wizard – a quick intuitive interface for manual entry of software license and software contract. Whether your customer deploys an IT asset management solution, operates discovery solutions from multiple suppliers or only now starts without the help of software discovery tooling, License Manager Services Provider Edition offers multiple options to import software audit data. We see that many organizations that start their orientation for Software Asset Management (SAM) already have some form of discovery/inventory deployed. That is why we offer a series of Audit Connectors that can recognize all sorts of industry recognized discovery solutions like Microsoft SCCM, Altiris Inventory, Novell ZENworks, FrontRange/Centennial Discovery, SNOW Discovery, etc. Your customer has no inventory solution deployed? For those organizations that have no inventory solution deployed, or see that their solution is not completely deployed and need instant additional network coverage, we offer Dashboard Discovery. Full integration with License Manager – Services Provider Edition is available. An increasing number of organizations deploy multiple discovery technologies for different system platforms or in separate geographical locations. Consolidation of data may become a challenge now. License Manager – Services Provider Edition imports, cleanses and stores data from multiple inventory sources in one unambiguous software audit repository. Automated Filtering and Cleansing of data Many discovery solutions are excellent in finding network content, including all ‘noise’ that has no significance for license management. License Manager – Services Provider Edition filters and cleanses all data from audit sources in such a way that only commercial licensable software is presented in the license management interface. Automated match between guest systems identified by the discovery solution with hosts identified by the Hypervisor. Grouping of fysical machines in data center clusters. Identification how software on virtual machines relates to the fysical host. All software installation data that is imported from discovery solutions is cleansed and normalized in automated procedures and is aligned with the naming and version conventions from the software supplier. Software bundles and suites are identified to be sure that correct licensing rules are applied and to prevent double counts. The Software Recognition Engine (‘Dictionary ‘) of the License Manager – Services Provider Edition is daily updated and available to services providers. The library contains software titles from over 10.000 software suppliers. This all implies that you cannot find a quicker and more proficient solution to produce your customer’s Effective Licensing Position (ELP) – take a look at the short video to see how quick an ELP is generated! Rather than a one-size-fits-all reconciliation approach offers License Manager– Services Provider Edition to license administrators a choice in license reconciliation strategies in line with the requirements and priorities of your customer’s organization. This allows you to opt for the most advantageous licensing position by prioritizing upgrades from old software entitlements or to make an exact reconciliation between specific installed versions and available software licenses (entitlement).Independent of the strategy will License Manager – Services Provider automate more of the reconciliation proces than any other solution, saving you time and money. Share dashboards, management reports & ELP statements. In order to give all Software Asset Management and license management stakeholders access to information that is relevant to their organizational role, License Manager – Services Provider Edition offers a wealth of management reports in the browser-based Cloud Console interface. And many, many more …. The reporting interface allows for the design of tailor-made reports for specific customer wishes. In case information from License Manager – Services Provider Edition is required for presentations or for further data manipulation, exports are available to Excel and CSV formats for use in 3rd party solutions. The Cloud Console Web Interface allows easy sharing of reports and other relevant information to authorized shareholders in the organization. The browser interface gives access to the suite of management reports, allowing isolating information for certain roles only. Demo – License Manager Is software license entitlement in line with software usage? Do you know the value of your deployed software? Are you overspending on software that is not (effectively) used? Can software licenses be deployed more effectively? All these questions and many more are directly answered for your customer with the deployment of License Manager – Services Provider Edition. Why License Manager – Services Provider Edition? Multi-tenant environment for individual dedicated support of your full customer range. License administration support through license bulk imports and license import wizard support. Software recognition in the ‘data cleanse ‘ process. License administration in fysical, virtual and data center domains: save time and avoid complexity by simultaneously optimizing licenses over all platforms at the customer site(s). Built-in reconciliation processes help determine the correct assignment of licenses. License Manager calculates the most effective deployment of available licenses. Dashboards & Management Reports: Role-based access to web reports in Cloud Console, turn sharing of compliance, costs and optimisation information into an easy and on-demand task.